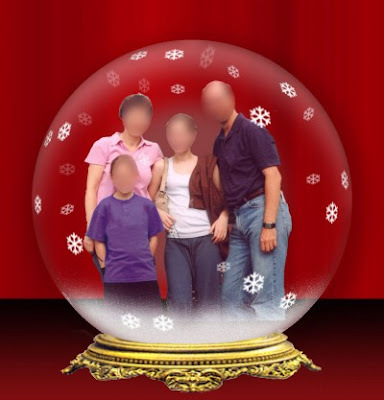 How to put yourself or your vacation pictures in a snow globe. When I wanted to make a snow globe for my Christmas card a couple years ago I was able to find instructions. (This one ...and this .) Instructions so complicated, that I set them in front of my pre-teen daughter and said, "Here, make me this. Leave out the stuff I don't need." So she did. 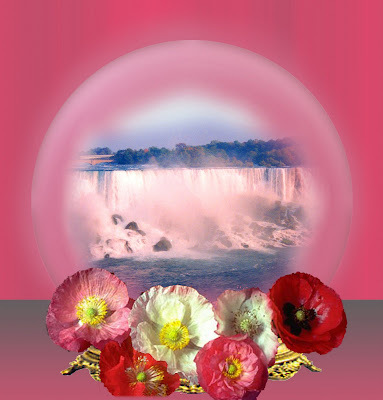 She saved me a stripped down Photoshop file of a snow globe. The base, the photo, and the background color are on separate layers. Sooooo.... you can open the file, change out the photo and the background color and make your own without having to reinvent the globe part. Isn't that nice? This works in my old Photoshop 6.0, Photoshop Elements 4, and Corel PhotoPaint 8. I'd be interested to see how it works with other progams, so leave a comment and let me know! Here's another one, with a scenery photo instead of people. Open the file. The layers menu will probably open, showing each individual element of the snow globe. If not, you will need to locate it and open or expand it. Click on the layer with the photo and replace my picture with yours. (I believe the picture is about 5 inches across). Select the background and any layers with color and change them to your favorites. Change the base, remove the flowers, move the snowflakes around. Whatever you like!